Welcome along to our live coverage of the Tour of Flanders. We're over half way through the race, with 111km to go. Before we bring you up to speed with what's happened so far, we can tell you tell you there has just been a huge crash on a descent. Two-time Flanders winner Stijn Devolder was the biggest name involved, but the Belgian is back on his bike. That's the latest of many crashes already in the race so far. Earlier, Johan Vansummeren collided with a spectator and is out of the race. The spectator has been taken to hospital and is reported to be in a critical condition. And again, it was caused by a collision with a spectator. Popovych is barely moving here. Looks like a shoulder/collarbone injury. The crash in which Devolder fell has cut the peloton in half. Two distinct groups on the road separated by about 100m. Looks like it's going to come back together imminently though. Another crash! Lotto Belisol's Tony Gallopin the man to hit the deck. He's back up and running again though. Omega Pharma - Quick-Step have done the bulk of the work on the front of the peloton today, with Trek Factory Racing occasionally chipping in. We also saw Sir Bradley Wiggins putting in a fairly lengthy turn as well a little earlier. Team Sky rider Gabriel Rasch is down now - yet another crash. 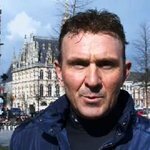 SkySportsJohan Museeuw runs through what to expect from the Tour of Flanders, an event he won three times. We're under 100km to go now - 96km to be precise - and the breakaway's gap is down to 3'05". Taylor Phinney is doing the most of the work on the front of the escape group. Bernie Eisel is right up there at the head of the race for Team Sky, but it's still OPQS who are doing most of the chasing. Luke Rowe is now up with Eisel at the head of the race for Team Sky. 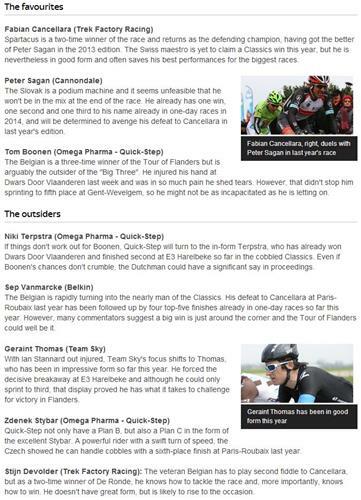 Haven't seen a great deal of Geraint Thomas for a little while. The women's Tour of Flanders is also taking place right now and there is about 15km to go. Boels-Dolmans' Ellen van Dijk - team-mate of Britain's Lizzie Armitstead - is currently leading solo. Just worth mentioning that the two groups of the peloton have reformed and it's all back together. Devolder is back in there after his crash. The pace in the peloton has slowed a little. Lots of riders taking natural breaks, having a drink and something to eat. The gap to the breakaway is now 3'02". The rigours of the route are taking its toll on the breakaway, which is now down to just six riders. In the women's race, a counter-attack has just set off in pursuit of Van Dijk. There are three riders in there: Lizzie Armitstead, Emma Johansson and Elisa Longo Borghini. They are 40 seconds behind. Orica-GreenEdge's Mitchell Docker has just attacked off the front of the peloton. He's got a small gap, no response from the pack yet. The peloton is quite bunched together at the moment, but it will line out again shortly when the riders hit the next climb, the Kaperij. Into the last 5km of the women's race. Van Dijk still has 38" over Johansson, Armitstead and Longo Borghini. Van Dijk into the final 1km now. Still solo. Ellen van Dijk (Boels-Dolmans) wins the women's Tour of Flanders solo. Lizzie Armitstead sprinted to second place in the women's race. That's her sixth podium in a row. If you fancy a laugh, take a look at Round 3 of the #SKYvOGE Battle Series where we take on our Orica-GreenEDGE counterparts in a supermarket sweep! Thanks for all the votes in our poll so far - it looks like Fabian Cancellara's favourite at the moment but it's tight at the top! Peter Sagan is now topping our opinion poll! He's been keeping his powder dry so far as we head back to the Oude Kwaremont with 65km to go. More riders down with Martin Reimer from MTN Quebeka looking particularly hurt, although he is dusting himself down now. Nice to see plenty of you fancy Geraint Thomas to do something today. He's certainly been looking good in training over the past few days. Trek Factory Racing are driving the peloton hard now. Astana and Belkin are now on the front. The pace is going to be really high heading onto the Oude Kwaremont! We've just been told there's nearly one million people watching on the roadside today! Perfect conditions in Belgium right now. Topsport's Kenneth Van Bilsen has just jumped from the peloton and will be aiming to bridge over to the Bernhard Eisel group.